Everyone has those moments when they think back and wonder what would have happened if they had followed a different path. Those crossroads where a decision was made that made your life as it is today. What regrets would you have if there was a path you didn't know about is suddenly made known to you. 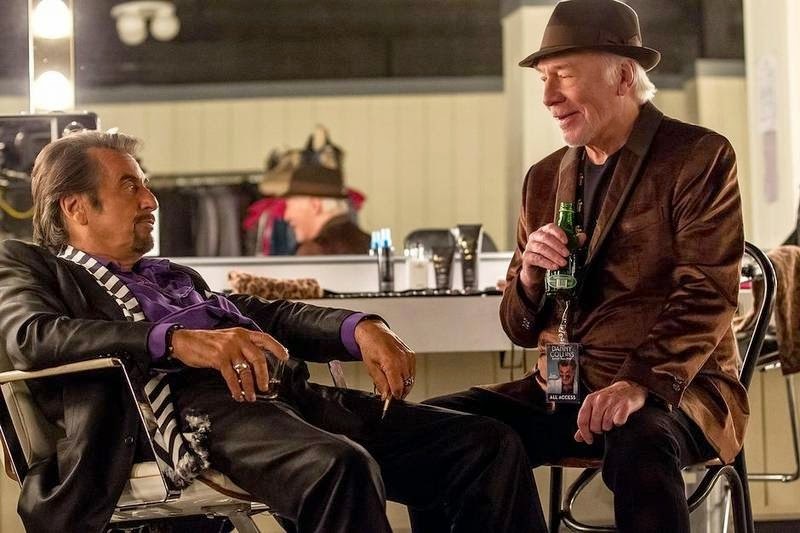 That's the case of Danny Collins who was an up and coming rock star is afraid of the fame and adulation that is coming his way. In his first printed interview he states John Lennon as his major influence. Lennon after reading the interview sends him a letter offering his help, but it is never delivered to Danny. So for 30 years, everything that he feared comes to pass. Al Pacino stars as the ageing Danny Collins who is stuck doing tours playing the same old music of his past in order to support his outrageous lifestyle that includes fancy cars, private planes, palatial homes, and a fiancee half his age. In his first feature directorial debut, Dan Fogleman who also wrote the script, based the story on folk singer Steve Tilston who actually did receive a letter from Lennon but didn't receive it til the wanning days of his career. Danny hasn't written a new song in thirty years. He's still a hard drinking, coke snorting womanizer, playing the whole rock star image. His grey haired fans get all hot when he sings his old hit song, “Hey Baby Doll” at sold out amphitheatre venues. Pacino sounds a little bit like Neil Diamond. He keeps himself pretty well self medicated to avoid the realities in his life. His agent and best friend Frank (Christopher Plummer) gifts Danny with the letter from John that was mailed to the magazine where his did his first interview. The editor held on to it, and Frank later picked it up from a collector. After Danny reads it he wonders what is life would have been had he received it back then. He decides to leave his plush Hollywood life, his girlfriend who he discovers is sleeping with a guy he dubs “busy work”, letting them stay in his house and use his credit cards and goes to a New Jersey Hilton where he plans to visit his son who he never met. Danny is full of charm and tries to flirt with the hotel manager Mary (Annette Bening) who admits she is not a fan of his work. He plays cupid to a couple of college kids working at the hotel (Josh Peck and Melissa Benoist). Then he tries to reconnect with angry son Tom Donnelly (Bobby Cannavale) who refuses to have anything to do with him. Tom's wife Samantha (Jennifer Garner) is more supportive wanting their ADHD daughter Hope to have a grandparent. Most of the movie revolves around Danny trying to make amends. But his social skills are somewhat jaded and ends up using his wealth to pay for a special school for Hope including a daily chauffeur for transportation. This drama/comedy is full of special moments that are entertaining, but somewhat by the numbers. It's a bit of a stretch to think of Pacino as an old rockstar with his increasingly craggy face, but as usual he sells it well. Bennings is sort of wasted as the reluctant love interest and their somewhat forced “patter”. Cannavale and Garner do well as the loving couple who must not only confront a life threatening illness, and a baby on the way which seems more like a contrived events that forces everything to come together. Will Danny eventually write new songs or will he continue to sell out? Pretty sure you know that answer to that one.